High street banks have closed more than 1,000 branches in the last two years, new research from Which? can reveal. As an independent review found that the banks could improve the way they engage with customers affected by potential closures, we found a total of 1,046 branches were shut between January 2015 and January 2017, with rural areas among the worst affected. Using figures we requested from the banks in October 2016, and online statistics, we compiled closure data from the last two years. 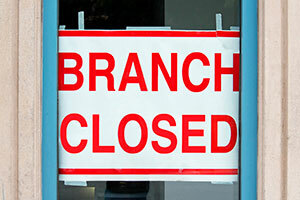 We found HSBC had cut the most branches in this period – 321 or 27% of their branch network – followed by Lloyds Banking Group which has closed 180 branches (14% of the network) and RBS Group (191 branches, 10% of its network). You can see the total number of closures in the table at the end of this page. Our map shows the areas with the most closures per 100,000 people. You can search for your local authority to see how it’s been affected. The regions with the most closures are Wales, Scotland and south-west England, all of which have large rural areas. We’ve also highlighted four areas where inadequate broadband speed may hinder access to online banking. Amid concerns over the rate of bank closures, the banks signed an ‘Access to Banking Protocol’ in May 2015. This set out guidelines aimed at minimising the impact of closures. One of the alternatives often cited as a place where customers can deposit or withdraw money and check their balance is the Post Office. However, our research found 41% of those in our survey didn’t know they could access basic banking services via the Post Office. This reflects the findings of Professor Russel Griggs, who carried out a recent review into the protocol. He found just 11% of customers had used the Post Office more because their local branch had shut. We put our findings to HSBC. It told us that the amount of footfall in its branches had fallen on average by 40% in the last five years as a result of more customers banking online.But while 56% of us now use online banking according to government figures, that still leaves around 20 million who haven’t used it and rely on a branch. Peter Vicary-Smith, Which? chief executive officer, said: ‘Access to the services necessary to make everyday banking possible should be simple and straightforward. We’ve seen some good examples of banks acting responsibly and in the interest of local communities when they close branches. We compiled figures for branch closures since January 2015 by asking the major high street banks and by collecting statistics online. Since we carried out our research in October 2016, Lloyds Bank has now told us it will close a total of 212 branches by January 2017, not 180. The Co-op has closed a large proportion of its network due to its merger with the Britannia in 2009, with closures taking place in areas where two branches were near to each other.